Brandon Denochick's family at the 2012 benefit tournament. PHILIPSBURG - The Unity and Moshannon Valley Church Softball Leagues joined forces for the sixth consecutive year to help someone in need. 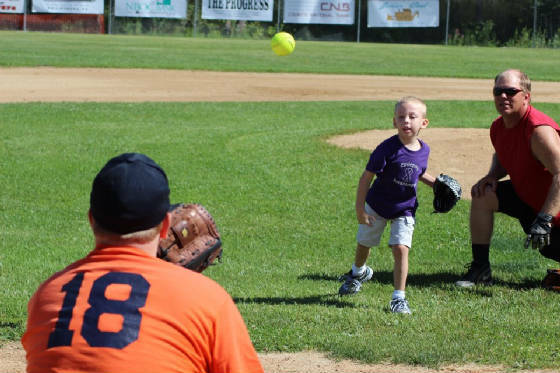 The leagues held a benefit softball tournament Aug. 10 and hosted a rec tournament Aug. 11 at the Powerhouse Fields. The event raised $3,145.15 for Philipsburg-Osceola grad, Lacy Magagnotti who was diagnosed with liver cancer. Lacy attended a portion of the rec tournament with her husband, Frank and daughter, Mia. Please keep Lacy in your prayers as she continues to fight! BIGLER - Teams representing the Unity and Moshannon Valley Church Softball Leagues, businesses and law enforcement agenices combined to raise $1,233.58 for the Make-A-Wish Foundation in memory of Brandon Denochick at the 4th Annual Benefit Tournament in August. Denochick, a West Branch Area High School student, died of cancer earlier this year. Our donation will help Punxsutawney-based Make-A-Wish grant wishes for Clearfield County children. Last year's benefit tournament recipient, Ian Matsko is one of man children blessed by the Make-A-Wish Foundation. WOODLAND - West Branch United Methodist Churches and Gethsemane United Methodist Church competed in a doubleheader at the Defeat Cancer Carnival held at Woodland Park Saturday, raising money for four area families. The teams combined to raise just shy of $200 for Emily Whitehead, Brandon Denochick and others. PHILIPSBURG - Unity Church Softball League held a love offering in March at each of its member churches, raising $2,940 for the Emily Whitehead family. Emily is a 7 year-old from Philipsburg who was diagnosed with leukemia. She underwent a number of treatments, including one involving T-cells and was declared cancer free last week. Unity League presented a check to Emily's grandfather at its April meeting, and continues to keep the Whiteheads in its thoughts and prayers. OSCEOLA MILLS - Teams representing nine Clearfield County churches and three law enforcement agencies raised $2,049 at our softball tournament this fall to purchase five portable Breathalyzers. The second annual Clearfield County Benefit Tournament held at Osceola Mills Recreation Park helped raise enough money to donate PBt units to the Pennsylvania State Police at Woodland and Philipsburg and to the Clearfield County Probation Department. Unity Church Softball League and Moshannon Valley Church Softball League co-hosted the event, and league presidents Josh Woods and Prestyn Showers presented Intoximeter PBts to all three agencies on Nov. 24. Purchase of the units was made possible by our $5 per player tournament fee, food sales and a Chinese auction. Ken and Debby Iwaniec served as guest speakers at our event this year. The Iwaniecs spoke about the dangers of drinking and driving, drawing on the experience of losing their son, Trooper Kenton Iwaniec. A drunk driver killed Kenton on March 27, 2008. In honor of their son, the Iwaniecs have made it their personal goal to provide PBts to all of the state’s PSP barracks. In addition to the guest speaker, programs containing alcohol awareness information were distributed at the tournament. The programs were paid for through a mini grant that Unity League received from Clearfield-Jefferson Heroin Task Force and Baltimore Life Insurance Co.
BIGLER - Unity Church Softball League, in conjunction with Moshannon Valley Church Softball League teamed up on Aug. 20-21 to raise money for the family of 3 year-old Ian Matsko at its 3rd Annual Benefit Tournament. Eight church teams participated in a tournament on Saturday, Aug. 20, while six rec teams participated in a tournament on Sunday, Aug. 21 to raise money for Ian. A Chinese auction was held, and entertainment was provided by local Christian artist, Heavenbound. The event raised $2,175 for Ian, the son of Brandi Matsko of Grassflat, who has a disorder his doctor calls pharmoco-resistent atypical epilepsy. In simpler terms, Ian has seizures that medicines are unable to control. Our league's contribution helped Ian's family pay for the five different medications he takes three times a day, and a medicine he is trying from Canada that is costly because it is not FDA-approved. PHILIPSBURG - Unity League conducted its annual food drive during the month of May at all league games held at Bigler Senior League Field, Osceola Mills Teener League Field, Kylertown Teener League Field and First Church of Christ Field. Players were asked to bring non-perishable food items with them to their games. All of the items collected were donated to the Gethsemane and Osceola Mills food pantrys and would be used to help feed low-to-moderate income families in our area. 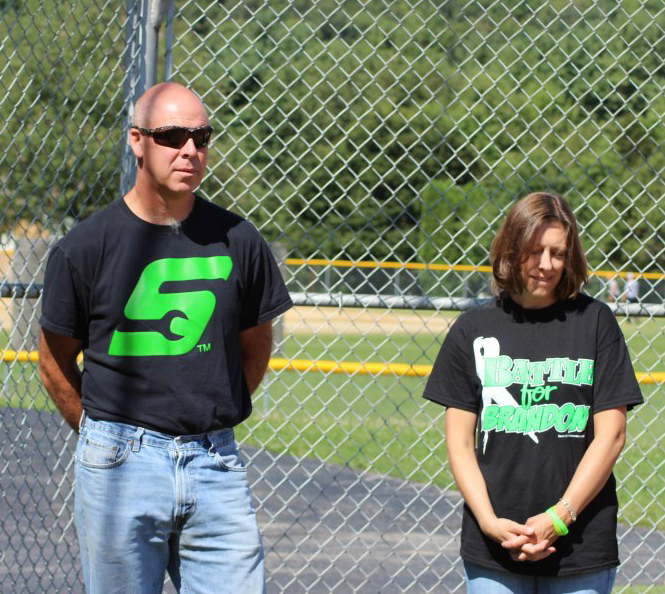 MORRISDALE - On Saturday, August 29th, 2009 the inaugural Clearfield County Church Softball Benefit Tournament was held to help an area boy in need. Teams from the Unity and Moshannon Valley Church Softball Leagues teamed up to raise money for the Bobby Gormont family. Bobby Gormont is a 13 year-old boy from central Pennsylvania. His mom's name is Ricki, and he has a sister named Erin. His father, Bob, passed away a few years ago. Bobby is a boy on fire for the things of God. He loves going to church and as Pastor Ryan can attest to, loves to speak out for the Lord. Last fall, Bobby wrecked his bicycle and incurred a serious injury. Eight area church softball teams came together for the tournament and raised close to $2,250 for the Gormont family. Proceeds came from team tournament fees and a Chinese Auction. Unity League would like to thank everyone involved, including Prestyn and Gene Showers who helped organize the event, all of the area businesses who donated items to give away as prizes and those who made baked goods to sell. MORRISDALE - Unity League held its second annual roadside cleanup on the first day of fishing season 2009 at Route 53, Morrisdale. Crews collected five huge Glad bags of litter that will be hauled away by Pennsylvania Department of Transportation. Members of Gethsemane United Methodist, First Church of Christ and Summit Hill United Methodist took part in the event. KYLERTOWN - Fourteen area children were treated to Unity League's inuagural Easter egg hunt held at Kylertown Teener League Field. Kids from Gethsemane United Methodist, Calvary United Methodist, First Church of Christ, S.S. Peter & Paul and Karthaus Community Alliance Church participated in the event. League organizers hid 250 chocolate-filled eggs, and gave away Pizza Hut gold cards. Unity League thanks Larry Conklin, Larry Conklin Jr. and Mike Saggese for their help. PHILIPSBURG - Unity League proudly announced its donation of $75 to Easter Seals of Central Pennsylvania during its 24th annual softball marathon. The donation will go towards children's speech and physical rehabilitation programs. UL's Gospel Tabernacle, under the sponsorship of Jabe Walker Trucking, participated in the event at Ferner Field in Tyrone. PHILIPSBURG - Unity League conducted its inaugural food drive during the month of July at all league games held at Martha's Park in Lanse, West Decatur Little League Field and Kylertown Teener League Field. Players were asked to bring non-perishable food items with them to their games. Each of the items collected were donated to the Gethsemane and Philipsburg food banks and will help feed low to moderate income families in our area. MORRISDALE - Members of the Calvary, Gethsemane and Summit Hill United Methodist Churches did their part to keep our area's roadways clean during Earth Day weekend. A crew of 10 dedicated Unity League softball players cleaned a mile stretch of highway on Route 53, Morrisdale near Country Convenience store. In all, the group collected six supersized Glad bags full of trash that was hauled away by Pennsylvania Department of Transportation. The league thanks PennDOT for its assistance and its donation of trash bags, vests and gloves. Unity League is a non-denominational, non-profit slow pitch softball league whose goal is to achieve faith, fun and fellowship through sporting and community events.